Christ heals one sick of the palsy. (1-12) Levi's call, and the entertainment given to Jesus. (13-17) Why Christ's disciples did not fast. 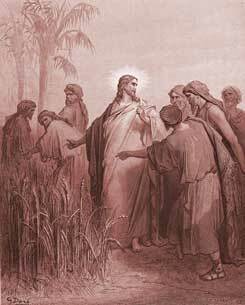 (18-22) He justifies his disciples for plucking corn on the sabbath. (23-28)1-12 It was this man's misery that he needed to be so carried, and shows the suffering state of human life; it was kind of those who so carried him, and teaches the compassion that should be in men, toward their fellow-creatures in distress. True faith and strong faith may work in various ways; but it shall be accepted and approved by Jesus Christ. Sin is the cause of all our pains and sicknesses. The way to remove the effect, is to take away the cause. Pardon of sin strikes at the root of all diseases. Christ proved his power to forgive sin, by showing his power to cure the man sick of the palsy. And his curing diseases was a figure of his pardoning sin, for sin is the disease of the soul; when it is pardoned, it is healed. When we see what Christ does in healing souls, we must own that we never saw the like. Most men think themselves whole; they feel no need of a physician, therefore despise or neglect Christ and his gospel. But the convinced, humbled sinner, who despairs of all help, excepting from the Saviour, will show his faith by applying to him without delay. 13-17 Matthew was not a good character, or else, being a Jew, he would never have been a publican, that is, a tax-gatherer for the Romans. However, Christ called this publican to follow him. With God, through Christ, there is mercy to pardon the greatest sins, and grace to change the greatest sinners, and make them holy. A faithful, fair-dealing publican was rare. And because the Jews had a particular hatred to an office which proved that they were subject to the Romans, they gave these tax-gatherers an ill name. But such as these our blessed Lord did not hesitate to converse with, when he appeared in the likeness of sinful flesh. And it is no new thing for that which is both well done and well designed, to be slandered, and turned to the reproach of the wisest and best of men. Christ would not withdraw, though the Pharisees were offended. If the world had been righteous, there had been no occasion for his coming, either to preach repentance, or to purchase forgiveness. We must not keep company with ungodly men out of love to their vain conversation; but we are to show love to their souls, remembering that our good Physician had the power of healing in himself, and was in no danger of taking the disease; but it is not so with us. In trying to do good to others, let us be careful we do not get harm to ourselves. 18-22 Strict professors are apt to blame all that do not fully come up to their own views. Christ did not escape slanders; we should be willing to bear them, as well as careful not to deserve them; but should attend to every part of our duty in its proper order and season. 23-28 The sabbath is a sacred and Divine institution; a privilege and benefit, not a task and drudgery. God never designed it to be a burden to us, therefore we must not make it so to ourselves. The sabbath was instituted for the good of mankind, as living in society, having many wants and troubles, preparing for a state of happiness or misery. Man was not made for the sabbath, as if his keeping it could be of service to God, nor was he commanded to keep it outward observances to his real hurt. Every observance respecting it, is to be interpreted by the rule of mercy. verse 8,9,10, Jesus once again teaches us two of numerous desires of Jehovah /GOD for mankind; 1st forgiveness of sin, 2nd healing of sickness; also SALVATION through the shed BLOOD OF JESUS; though SALVATION appears to be the last desire, it is the #1 desire of GOD for us. The religious people seem to be the trouble makers always stirring things up. verses 6,7 and 16. Jesus has the power on earth to forgive sins then proves it . This is a sign given to the world to believe that he will do what he says.What does it mean to have your sins removed and forgiven?If the world denies him as it does, how can its sins be forgiven?How can it ever know what forgiveness is, or know that He will do and keep His promise. His WORD is what cleanses us. A SIMPLE MESSAGE. God is the omnipotent,alpha and omega. Jesus in action! Healing the sick, showing the doubters that He is the son of God and dining with sinners. In verse 17, He said " I came not to call the righteous, but sinners to repentance." So he came to call us to repentance. The world should hearken. Judgement day is fast approaching. Jesus is the great I am. He forgives sins and heals the sick. He loves the willing souls to come to Him. He is Lord of the Sabbath and does not relent on the Sabbath to anyone. He loves the sinners to come to Him for salvation. He is the only living and true God Amen. V.27 - the '7th' day is this AGE of Grace; it's open-ended- so ALL can be saved (but won't). The 7thday will CLOSE at the Rapture - when this day of Grace has ended. For 23-28: When the LORD had Moses appoint Captains and Rulers out of each Tribe, it was to teach us to judge one another, and to rule with justness and compassion, and not seek to bring every offense to God for judgment: for when the matter was brought to God, it was expected that He would judge absolutely. The law was not made for oppressing anyone; but to teach us Christ's character of love. What Do You Think of Mark 2? In what city did four people let a man with palsy down through the roof to be healed?